After debate, Student Senate decided to defund the Student Organization Leadership Consultants (SOLC) with a vote of 27-3-1 after problems arose surrounding their alleged academic affiliations. Senate approved the final budget last night, in which SOLC did not receive any of the $17,000 budgeted to them in the past. No significant motion has been made with regards to the defunding of SOLC until now. Senate believes SOLC has academic affiliations to the Center for Student Leadership Development (CSLD), which includes the leadership studies minor. The alleged ties to the CSLD is what jeopardized their ability to remain a funded affiliate organization. Furthermore, the class for advanced facilitation techniques and the SOLC club met at the same time, on the same day, and in the same place. “It has been clear to Senate that SOLC existed to help students in the leadership minor- through class or an extension of the leadership minor,” said Student Organization Advisory and Review Committee (SOARC) Chair Austin Cordova. In addition, Senate did not see any clear effort by SOLC to distance themselves from the CSLD or the leadership studies minor. In their eyes, operations with the CSLD remained the same and academic affiliations were still evident. However, according to Senate Rep. John Morabito, there has been no discussion in faculty-senate about the name change, and it still remains listed as “student organization of leadership consultants” on the University website when registering for classes. SOLC has said that they are not academically affiliated, and therefore should not be unfunded. Throughout the meeting, the organization maintained the stance that they are not academically affiliated, although they were unable to provide specific evidence to support that claim. 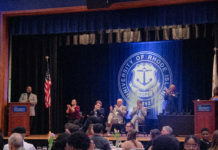 Instead, SOLC focused their argument on what benefits they provide for the students at URI and how student groups would be affected if they lost funding. However, this past fall, the SOARC committee brought a bill to the floor to vote on the funding status of the group. Cordova said he made it “explicitly clear” to SOLC that they would only stay funded until Senate could determine a way to assure group retreats would not be negatively affected by defunding SOLC. As a result of this, he and the rest of Senate felt that funding SOLC for the remainder of the academic year was the best solution. Cordova said they have now determined a resolution in which the retreats can stay funded even with SOLC being recognized as an academic affiliate. This is why Senate brought forth the vote again Wednesday which ultimately led to SOLC’s unfunded academic affiliate recognition. With the new process of acquiring funds for their retreats, groups must first go to SOLC to get approval. If SOLC approves their retreat, the group must then go to Senate in order to get approval for funding for the retreat. If the retreat costs under $250, which most retreats do, all the group needs is a signature from the finance chair. If the retreat costs between $250 and $1,000, the finance committee will have to approve it and if it is over $1,000 it would have to go to the senate floor. Essentially, groups will go to SOLC for planning the logistics of the retreat and then will go to Senate for the funds needed for the retreat. SOLC must also apply for contingency grants in order to train future staff members. Without secure funding, the organization is worried they may not be able to continue. “We attend different conferences that give us the skills to be better facilitators and so without guaranteed funding, it’s difficult to plan that and it’s difficult to ensure that we’ll be able to do that,” said Curtis. Senate believes that even without funding, SOLC will have a successful future training new facilitators. SOLC plans to look at alternate routes to get funding and plans to investigate what they believe was ‘voting bias’ in Senate’s decision.